Thirty years ago I quit my job in science and engineering. Even in my late 20’s I was tired and disgruntled with the world and my place in it. I wanted to get off the treadmill, and experience the beauty of Planet Earth, or at least my little corner of it. With my partner at that time, Jill Brown, we looked to the world of sailing for travel and adventure. We sold our home, built a small Polynesian-style catamaran and moved to the ocean. We struggled to make a living in Cornwall, one of the most beautiful counties in the British Isles. I built boats and wrote books and magazine articles. It took a few years but the dream eventually became reality and culminated in an extraordinary voyage around the west coast of Britain in the summer of 1990. Suilven’s Travels: A Life Changing Celtic Odyssey is my account of this 3 month cruise which was packed with adventure and challenge. Suilven II departed Plymouth in July and headed to the Hebrides, stopping in Scilly, Wales, the Isle of Man and Northern Ireland. The story brings to life the landscape and culture of western Britain and in particular Scotland’s Inner Hebrides. It also shows what is possible on a minimal budget if the desire to succeed is strong enough. I was alone for most of the outbound trip, giving me plenty of time to reflect on the world and my place in it. Jill Brown was with me on the demanding return trip when we struggled against gales and rough seas and came close to losing our small boat on a couple of occasions. Looking back nearly 25 years it’s obvious there has been dramatic change in our world – especially in technology. But the human spirit and the search for meaning in life is growing stronger as more of us realize it is becoming impossible to thrive in a system which essentially alienates us from our Earth, and our true selves. Suilven’s Travels was written to inspire others to step outside the box and live closer to the Earth. It is available for $3.99 as an eBook on Amazon, in multiple formats on Smashwords and will be available at many other outlets soon. 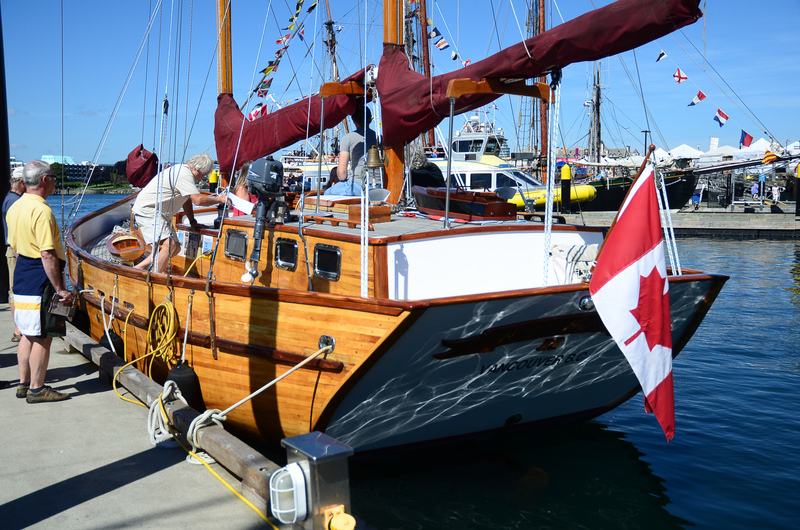 The Classic Boat Festival in Victoria was a great opportunity to experience the beauty of wooden boats. I didn’t venture far aboard Rainbird this summer but I certainly made the best of our spectacular weather. Here are a few interesting boats I passed during my travels. I know nothing about the history of these vessels but their uniqueness caught my eye. 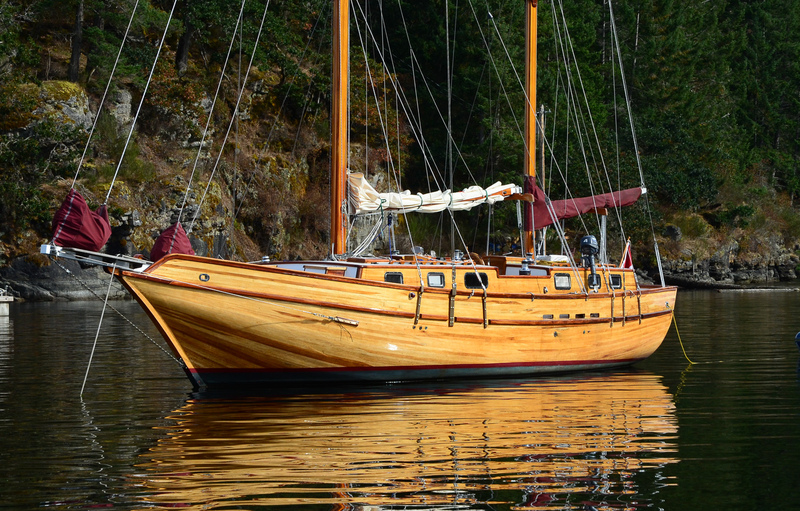 Beautiful strip-planked Wildwood, built on Vancouver Island, seen here in Maple Bay, on her way to the Victoria Classic Boat Festival. 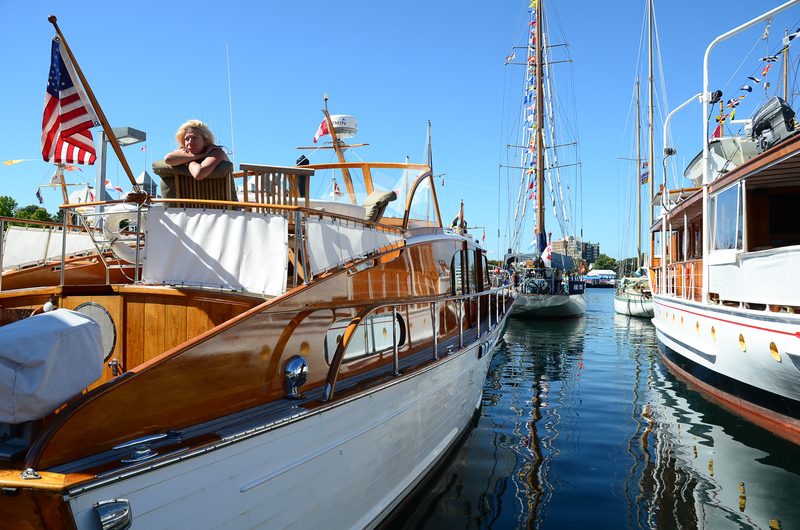 Stern view of Wildwood at the Victoria Classic Boat Festival. 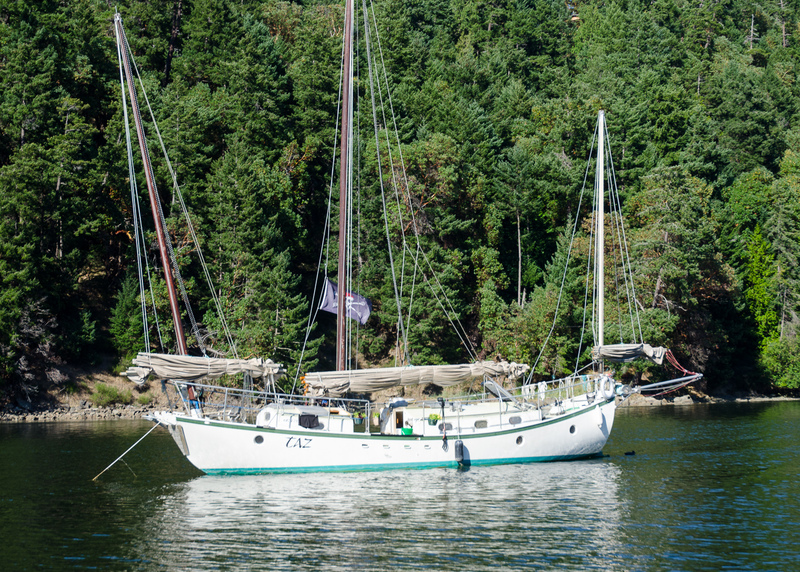 Taz, seen in Lyall Harbour, Saturna Island, BC. Looks like a steel hull to me. Seen in Lyall Harbour, Saturna Island, BC. Meg, Lyall Harbour, Saturna Island, BC. 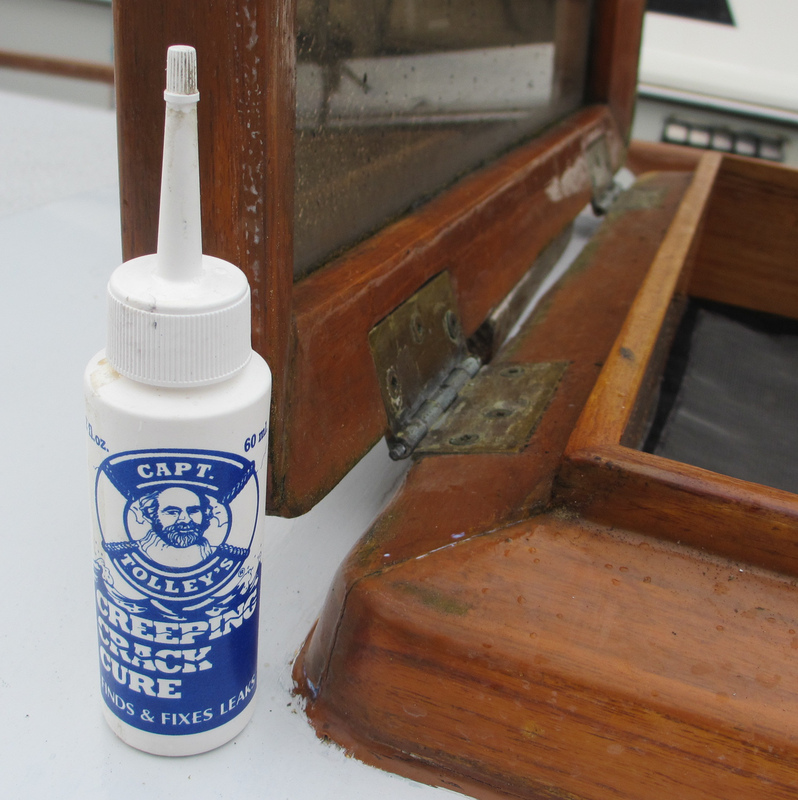 Captain Tolley’s Creeping Crack Cure fixed a leaking hatch coaming. After an unseasonably hot spell this spring, the heavens opened and the resulting deluge found its way through the nooks and crannies in the parched teak of my fore-hatch coaming. Thankfully the drips ended up on the cabin sole rather than the bunk. The cause of the leak was traced to a joint at the corner of the hatch, which had separated very slightly, allowing water to penetrate. 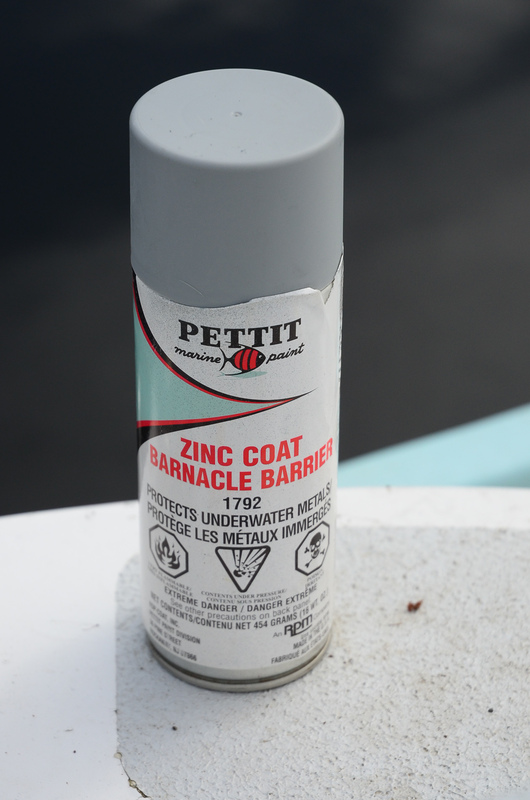 I was about to leave Rainbird for a few weeks so I rummaged through the glues and caulking box and pulled out a squeeze bottle with an interesting and humorous label; Capt. Tolley’s Creeping Crack Cure. It’s a thin white liquid, which disappears in the blink of an eye into fine cracks by capillary attraction. It solidifies and the instructions say that you should keep applying it every 30 minutes until no more is absorbed. A final application after a further 24 hours is recommended. Well, I followed the instructions and the following day doused the area with a hose and was pleased to see that the leak had stopped. That was four months ago and it still hasn’t come back. I’m not sure I would trust it as a permanent cure. Doing the job properly would involve dissembling the joint and rebuilding it and that’s no small task. For now I will just keep an eye on it. The 60ml bottle cost me around $12 and this amount will go a very long way. I can see it will be another valuable weapon in the battle against entropy. I have just spent over a year living aboard Rainbird and 20 years ago lived aboard a boat in the UK where I was born and raised. The boats are radically different and these two experiences have little in common, except perhaps, both were aboard wooden boats and both required the simplicity that living with less entails. The world has changed immensely in that time, and undoubtedly I have too, but it is fun to look back and compare the two experiences and see what can be learned. 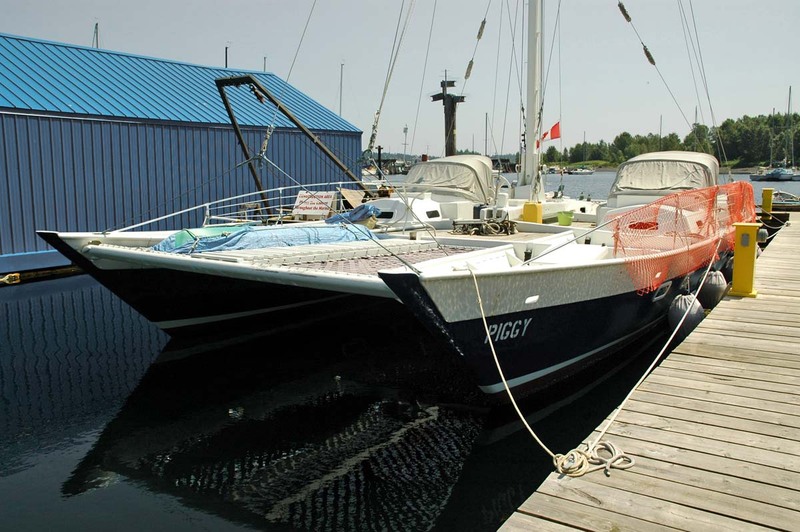 My first “big” boat, a James Wharram, Tiki 26 catamaran, is not the sort of vessel that comes to mind as a “live aboard.” The Tiki 26 is an very sea worthy, moderately fast, open-deck trailer-sailor with many ocean crossings to its credit. In fact, Rory McDougall’s Tiki 21, Cooking Fat, (essentially a small 26) circumnavigated in the ‘90s and is the smallest catamaran to ever to do so. The 21, seems tiny in comparison with the 26 and I can’t help but admire McDougall’s push-the-limits minimalist approach. But even with the relatively spacious hulls of the Tiki 26, supplemented in my case with a heavy duty PVC deck-tent, living aboard Suilven II was more akin to camping than what the average West Coast sailor would consider as “civilized” comfort. Thankfully an old 13 foot travel trailer (“caravan” in Brit speak) parked in a nearby boat yard served as an office and galley whilst living aboard. Oh yes, I should add that I was younger and fitter back then! The Tiki 26 was built in the attic of an old barn, in the middle of rural Oxfordshire, which is just about as far from the ocean you can get in the UK. It was the mid ‘80s and with the help of my partner at that time, we decided that the epoxy/glass/plywood Tiki – a relatively new and innovative design, with its distinctive soft wing-sail – would give us the “best bang for our buck.” Actually, we had never considered living aboard such a small boat except for short trips or expeditions, but economics soon dictated otherwise! 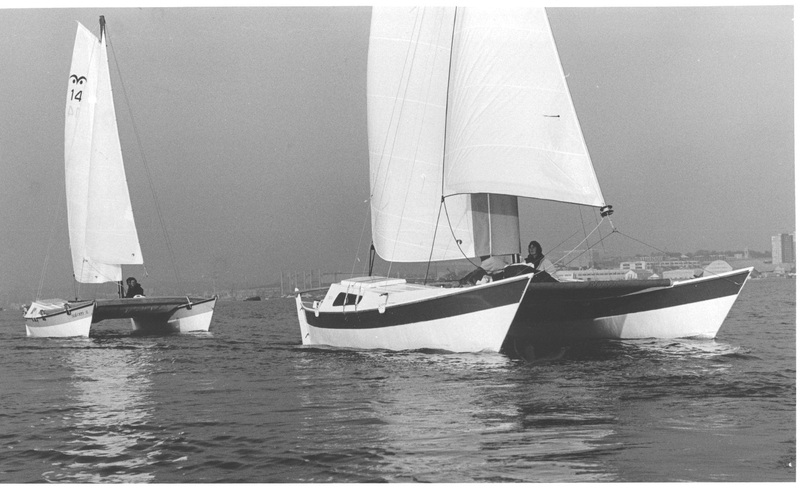 A GRP Tiki 26 (right) and Suilven II, our epoxy/glass/ply Tiki 26, sailing in the Tamar Estuary near Plymouth, UK, in the late ’80s. Once finished, we moved the boat and ourselves to the rural backwater of Foss Quay, Millbrook, in south east Cornwall which put us among multihull designers, builders and sailors. I found work building and repairing plywood multihulls and writing technical articles for sailing magazines such as Practical Boat Owner. 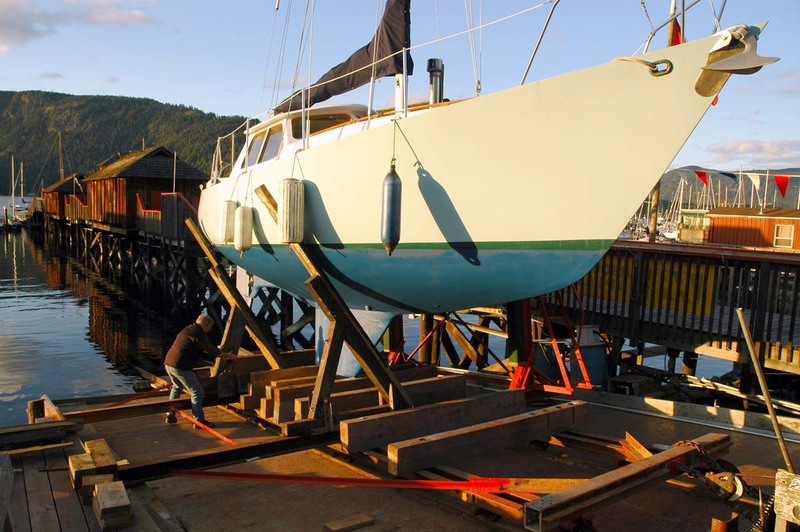 With no expensive rent or mortgage to pay we had the time and funds to go sailing – culminating in a 3 month trip around the west coast of Britain, which had been the inspiration for building the Tiki 26 in the first place. Without doubt, this was probably the most formative and exciting period of my life. I had left a science and engineering career and sold my house to follow a dream. In Cornwall I was rubbing shoulders with the likes of James Wharram, Richard and Lillian Woods, Pat Patterson and Darren Newton – all well known icons of multihull design and accomplished sailors. I also met some extraordinary young sailors (including Rory McDougall) who embarked on some remarkable voyages. At this time I also had the privilege of editing Sea People/Sailorman the journal of the Polynesian Catamaran Association, and this, I must say, was one of the most enjoyable jobs I have ever undertaken. I received some incredibly exciting and inspiring stories from around the world which would turn up in dog-eared, salt stained envelopes with exotic looking postage stamps. These would almost certainly be hand written, full of jaw dropping tales of coral atolls, typhoons and ocean crossings in amateur built, plywood Wharram catamarans. This 30 page bi-annual magazine was put together using one of the first laptop computers (space was at a real premium!) running desk-top publishing software – we are talking late ‘80s here! Seventy-five back editions are currently available on line. The Wharram community was truly amazing, and we spent many vacations cruising in company with other catamarans. The 26 drew less than 2 feet fully loaded and was just as happy sitting on a beach or at anchor. The deck space, stability and sense of security were fantastic and the elegant simplicity of the design made it a supremely practical sailing vessel. 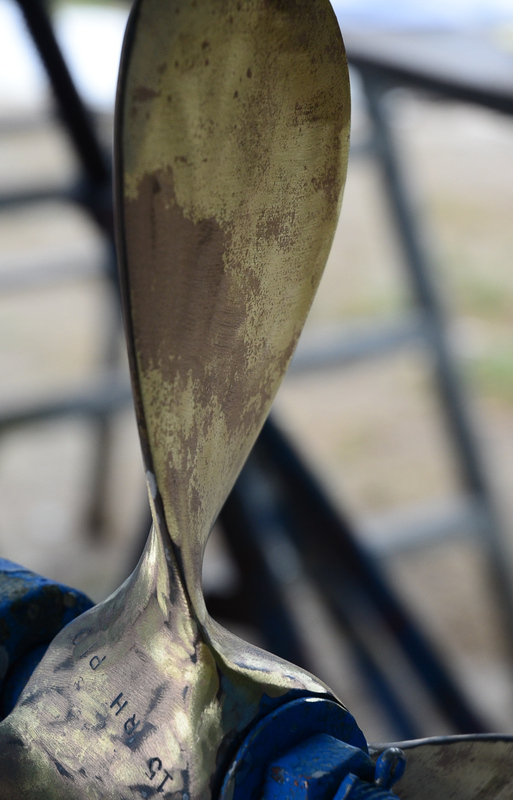 After all, Wharrams have their roots in boats that colonized the vast expanse of the Pacific. Undoubtedly, the most memorable aspect of the seven years I spent in Cornwall was the amazing souls I met, the sincere friendships that were formed, and the strong sense of community. We were all operating on shoe-strings but help was always close at hand. If you needed help launching a boat or stepping a mast you would put the word out, stick the kettle on and folks would turn up. This was how we got things done – though big jobs like turning over a hull might just cost you a case of beer! This ethos was always present when cruising. During my 3 month western Britain voyage, people were always willing to help in whatever way they could. Harbour masters always seemed interested in my exploits and often waived fees. Local sailors came for rides and were wonderfully generous, feeding me in their homes and taking me on local sight-seeing trips. At the time, I lived and breathed sailing and could not imagine myself doing anything else; multihulls were my world and I could not imagine myself in a monohull. I moved to British Columbia in 1996. After a frustrating few years up-to-my-arm-pits in glass-fibre dust, building “mega” yachts, I changed course completely and became a commercial pilot, flying instructor, aerial photographer, aircraft builder and test pilot and bush pilot. This was exciting and challenging but financially insecure and by the time the recession started to bite, making a living was becoming as precarious as it was dangerous. A change was needed. I had never lost the urge to go back to sea and at one point in the late ‘90s I did put down a deposit on a part-finished, 37’ steel monohull. The hull and deck were built and the engine installed. At $4,000 it was a steal but this boat was built to break ice and just about as heavy as they come. When I looked at the spars and equipment needed to complete it I realized I would need my own boatyard and crane to do it. I’m no Arnold Schwarzenegger and I realized that without a strong, capable crew, I wouldn’t be going far in this boat even if my back held out long enough to complete the fit-out. Fast forward another 10 years. 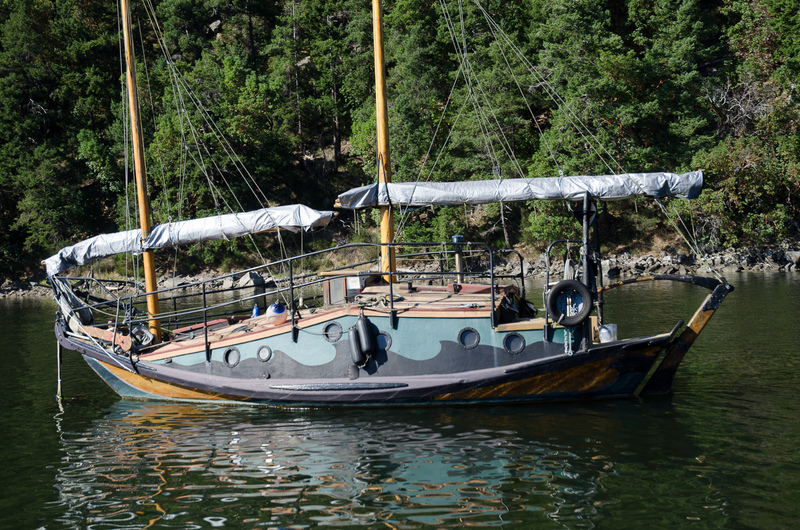 I just happened to be looking at boats on Kijiji when I came across a Bill Garden 33’ pilot house sloop, cold-molded cedar and built 35 years ago as a live aboard. “Take a look at this – looks like a good deal,” I said to my wife rather innocently. Rainbird on the ways at the Cowichan Wooden Boat Society for her annual haul out. A few weeks went by and I started noticing sailing magazines laying around in the kitchen and living room and a sudden interest in sailing coming from my wife. This spurred me on and I started looking at designs with building in mind and one day I announced to her that I was going to send for some study plans for a 30’ cutter I had taken a liking to. I had to think hard, but it started to come back. You could have knocked me over with a feather! When the story finally tumbled out, she had sent the details to one of my Foss Quay friends who had finally thrown down the hook in New Zealand and asked for his opinion, which turned out to be very encouraging. She was going to keep the surprise until Christmas! What a woman! Of course, my wife, being far more sensible and realistic than me, knew that I found it difficult to find the time to fix a leaking kitchen tap let alone find the time to build a 30’ boat. Besides, the cost of materials and equipment to build a similar boat would be more than she paid for Rainbird. As far as I can determine, Rainbird’s lines were replicated in the Truant 33 and the Saturna 33, two popular and capable West Coast boats. Rainbird is exactly the live aboard Suilven II wasn’t – she has interior space and it is well laid out and very functional and comfortable. With her tall rig she also sails well and with a 30 HP Perkins diesel she has the power to make headway when the going gets tough. In fact, Rainbird has proven to be a great choice for West Coast – much better than even a large Wharram would have been for these waters. One hull is easier to heat and keep dry than two. Finding live aboard moorage at a reasonable rate would be darn nearly impossible for a large catamaran in these crowded waters – it was tough enough finding moorage for Rainbird. Living aboard, even in mid winter, is cozy thanks to a Dickinson Pacific stove (also a delight to cook with when you get the hang of it) and shore-side 110V power. I was working for the Cowichan Wooden Boat Society last winter and my commute was a one minute stroll down the dock. Doesn’t get better than that! No oozing, black, Foss Quay mud to wade through at low tide and in Cowichan Bay I could head down the street for coffee and fresh croissants. All very civilized but the flip side was that with the community lights I never got to see the stars and other than the occasional motion from a south easterly gale I hardly knew I was afloat! With narrow channels, strong tides and fickle winds, reliable power – and preferably lots of it – is important in these waters. 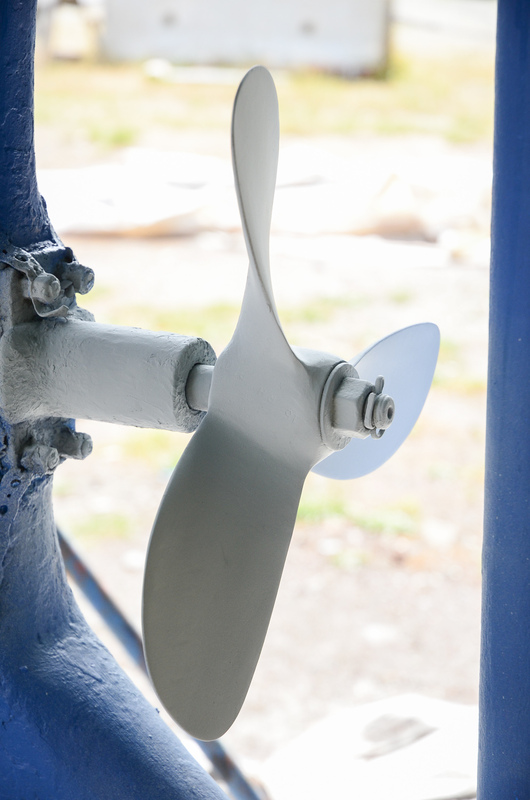 Wharrams generally rely on outboards which don’t always work well in a chop and windage and maneuverability can be challenging in blustery conditions. Some of the bigger Wharrams use twin outboards for this reason. For live aboard comfort and cruising in the Pacific North West, a monohull like Rainbird is probably going to more comfortable than a Wharram. However, for extended, economical, blue water cruising in warmer climates I would definitely go for the Wharram. The deck space is liberating, and I enjoy being able to anchor in shallow water in busy anchorages, or even run up on a beach. Indeed, I suspect that there is a very good, underlying reason that multihulls evolved in the warm Pacific waters! Of course, this is just my opinion, and as we know, we sailors can be quite opinionated when it comes to our boats! But an open mind and a sense of adventure are probably more important than the choice of boat when it comes to life afloat. Some people do amazing things with very little. As for the sailing community, well, I haven’t quite found another “Foss Quay” yet. It is a fond memory but I occasionally have to remind myself we weren’t always happy campers – the sailing community has its infighting just like any other! But now as a member of the Cowichan Wooden Boat Society, I now have access to their workshop and ways and help is close at hand. For those of us sailing on a budget, the Society is a valuable resource. 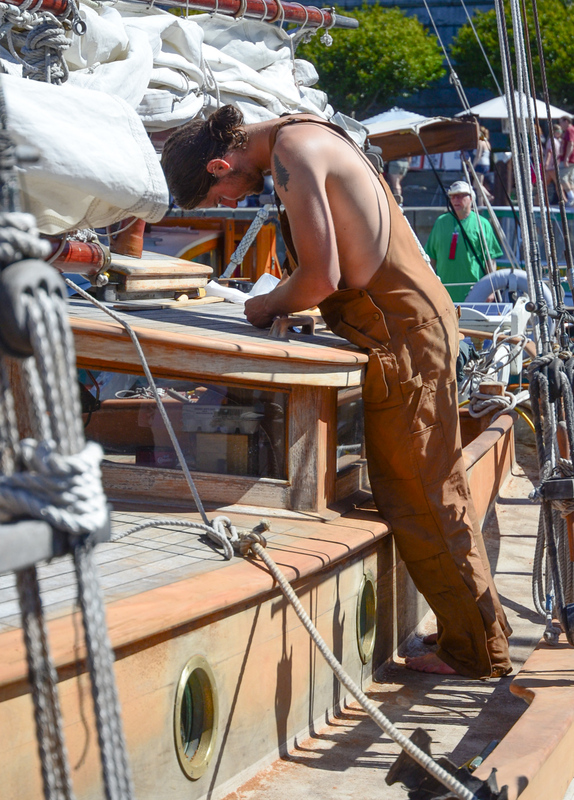 I am also a member of the Center For Wooden Boats in Port Townsend, as I believe it is important to keep the knowledge and skills of wooden boat building alive. 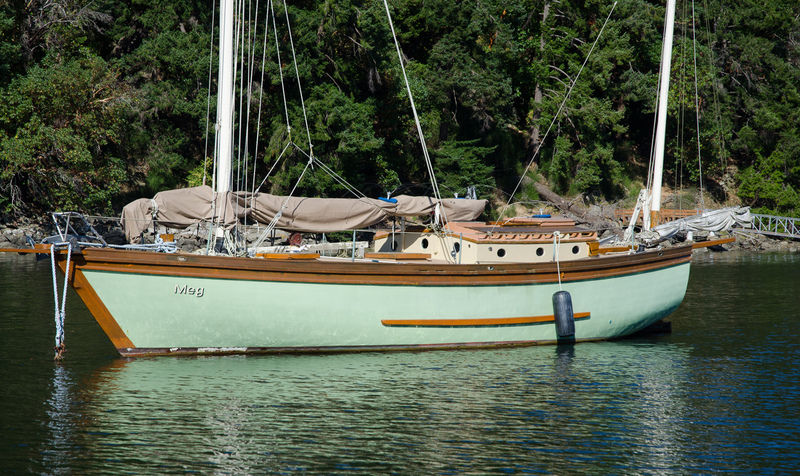 Piggy is a large “Classic” Wharram – a 45′ “Ariki”designed for ocean racing. She was photographed at the Ladysmith Maritime Society this summer. She was launched thirty-nine years ago and has made a circumnavigation. Her owner is currently getting her ready for a second.